Easy to see from a distance! Laminated calling board features large numbers and letters that are easy to see from a distance. Includes 75 transparent red static-cling chips that stick to the board. Wash regularly for best results. 30-1/2" x 41". 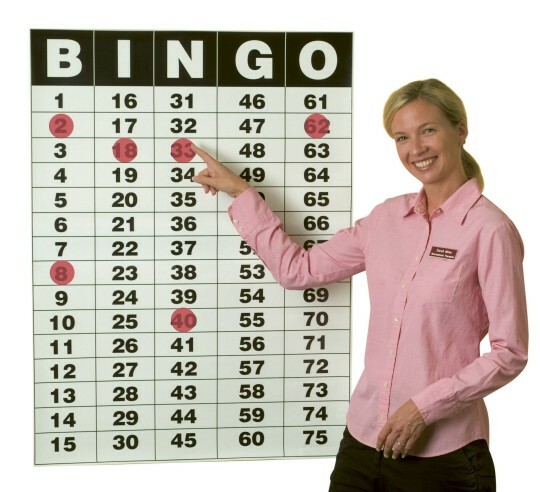 Assembled Height 30.5" Assembled Length 41"
BINGO CALLING BOARD WORKS GREAT! We have used this for our weekly HOA Clubhouse bingo sessions 4 times already it works out fine. You just need someone to rub the plastic dots on the board remove them after each game. They are a filmy vinyl and I have found that using an index card works best to scrape them off as they really get stuck on there with the static electricity.We put them back on the paper strips they came on so they don't stick together. We tape the laminated paper board to a wall and remove it each week. For the price it does the job!